Whitemetal Kit. 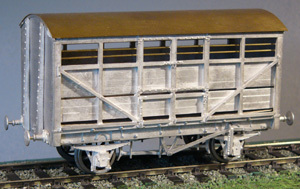 The standard LBSCR cattle wagon, developed from a Stroudley Design. Built with small variations in brake gear and axleboxes until 1917. Six were transferred to the Isle of Wight where one is preserved. Eight spoke wagon wheels needed to complete.